Westerville Police Officer Bryan Schwartz is pictured alongside Fiji, his K9 partner. 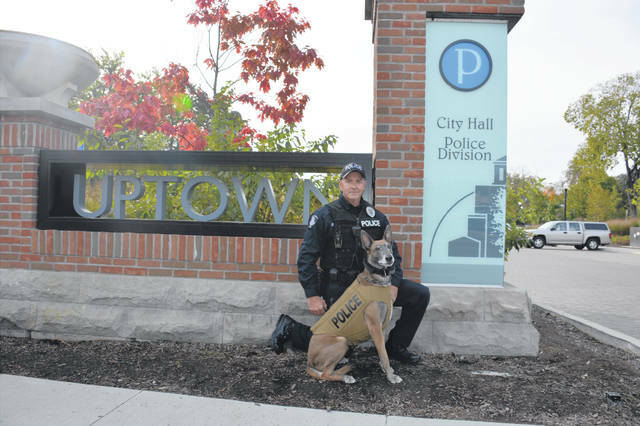 The Westerville Division of Police’s (WPD) K9 Fiji has received a bullet and stab protective vest thanks to a charitable donation from nonprofit organization Vested Interest in K9s, Inc.
Fiji has been a WPD K9 officer for nearly six years, working with Officer Bryan Schwartz. A 7-year-old Belgian Malinois, she and Schwartz have won multiple awards for alertness and focus among other competitive tasks. Since 2013, the duo won eight gold, three silver, and four bronze medals at the Ohio Police and Fire Games. She has also been awarded two exceptional duty and one life-saving medal. bullet and stab protective vests and other assistance to dogs of law enforcement and related agencies throughout the United States. The nonprofit was established in 2009 to assist law enforcement agencies with this potentially lifesaving body armor for their four-legged K9 officers. Since its inception, Vested Interest in K9s, Inc. has provided more than 3,000 protective vests in 50 states through private and corporate donations at a value of $5.7 million. Protective vests for law enforcement K9 dogs are valued between $1,700-$2,200. They weigh an average of four to five pounds and are custom fit to streamline the contour of the dog to maximize protection. The vests have a lifespan and warranty of five years. Fiji’s existing body armour was set to soon expire. The K9 protective vest program is open to dogs at least 20 months of age actively employed in the U.S. with law enforcement or related certified agencies. New K9 graduates, as well as K9s with expired vests, are eligible to participate. For more information on the Westerville Division of Police, please visit www.westerville.org/police. For more information or to learn about volunteer opportunities, please call (508) 824-6978. Vested Interest in K9s, Inc. provides information, lists events, and accepts tax-deductible donations of any denomination at www.vik9s.org or mailed to P.O. Box 9 East Taunton, MA 02718. Submitted by the City of Westerville.